Hello everyone! 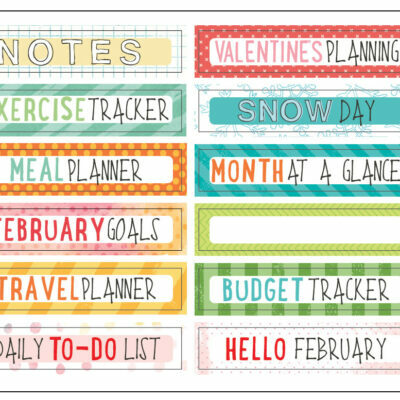 Are you ready for a fresh take on the Simple Dori traveler’s notebook? Ariana and I both flipped our notebooks sideways to scrapbook photos with a landscape orientation. 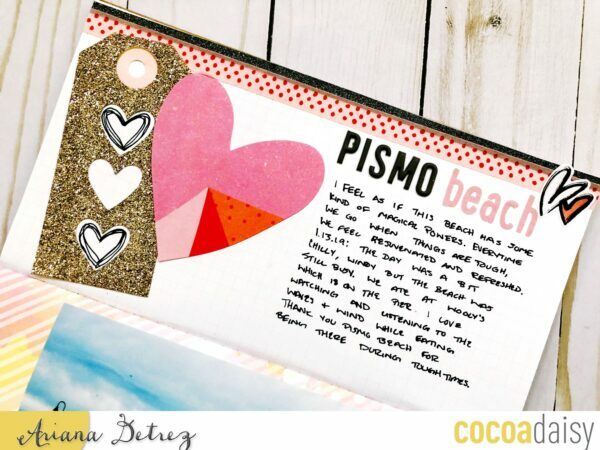 Here you can see how perfect this choice was for Ariana’s lovely beach layout made with January’s Simon and Betty kit. 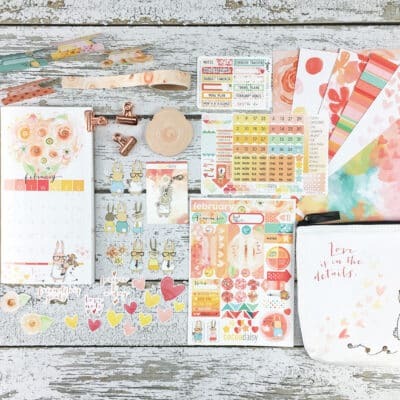 Ariana accented her handwritten journaling at the top half of the spread with colorful polka dots, hearts, and her title, balancing the photo and details below. 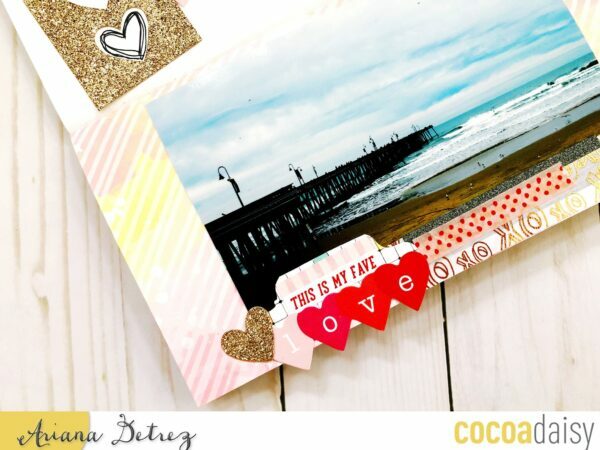 The photo of the beach is clearly the centerpiece of the page with the spread oriented this way, and I love how its blues come to life again all the contrasting pinks and yellow. 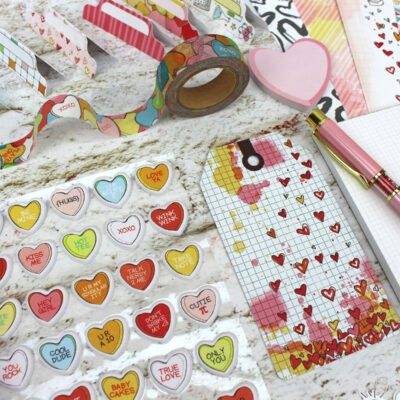 Ariana grounds the photo with stamps and die-cuts from the kit, and notice how the hearts overlap the edge of the page a bit. 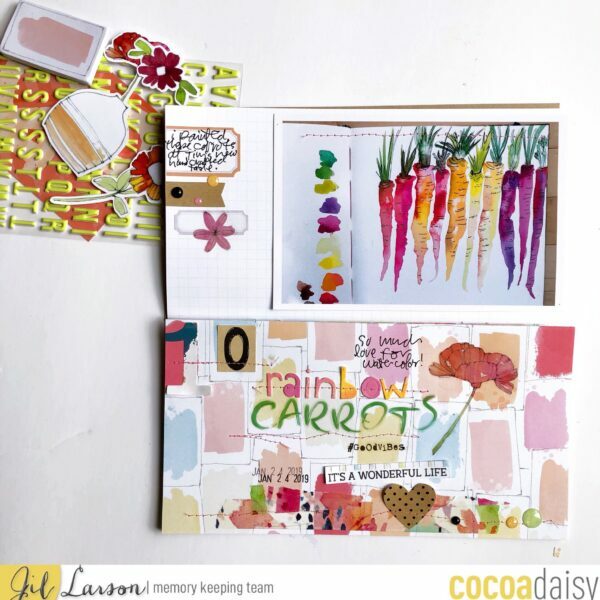 My project works with the new February kit, Fresh Cut, which is watercolor-inspired and so perfect for documenting my watercolor painting of 10 rainbow carrots. Like Ariana’s page, mine is oriented sideways, but the design is a little different because I placed my photo on top. The landscape format helps me do justice to the lined-up quality of those colorful carrots. This detail shot shows how I layered lots of Fresh Cut goodness over the watercolor swatch paper in the notebook: flower and word rub-ons, the clear brush-script stickers (the green ones are in the pocket page kit), washi tape, die cuts, and number stickers from the classified kit. I added letters cut with my die-cut machine and pink stitching for a little texture. 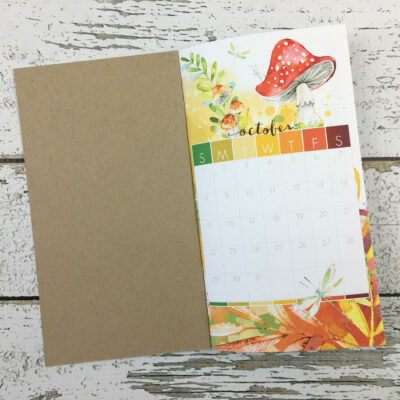 A few of the pretty enamel dots along with touches of kraft and black finish off my spread, and here you can see what the sideways page looks like in the notebook. 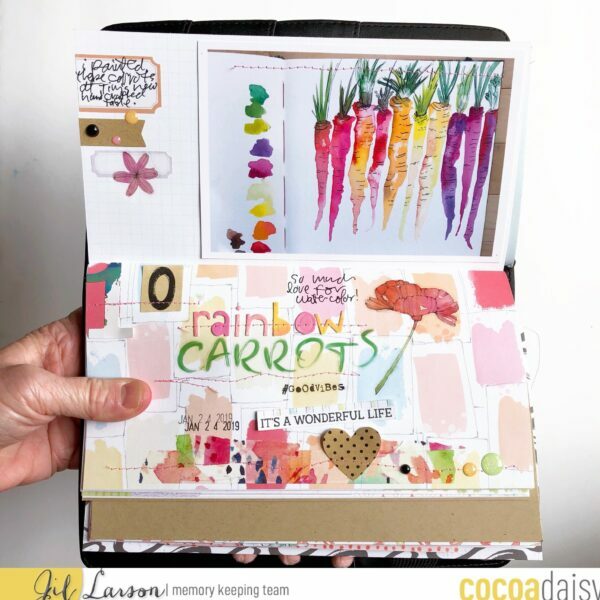 If you decide to experiment with this landscape look for some of your Simple Dori pages, be sure to post to the Cocoa Daisy Facebook group or to Instagram with a hashtag that will help us find you. Can’t wait to see what you make!